Villa Paraíso is a beautiful villa plot of 1000m² (with detach apartment) that is located in the town of Soo west of the municipality of Teguise and belongs to the Chinijo Natural Park. It is in an ideal enclave, flanked by the beaches of La Santa, to the west, and Famara, to the east. The main villa has on the first floor 4 bedrooms: a master bedroom with double bed and balcony with mountain and pool area views. Two bedrooms with two single beds in each one of them and an extra bedroom with a sofa bed. It also has a bathroom with a bathtub. In the lower floor you can enjoy 2 bedrooms: one with double bed and access directly to the terrace and another with two single beds. It has a bathroom with shower, a living room, kitchen and a room with some utilities and washing machine. This apartment allows privacy in case of occupation of the main Villa. It has a bedroom with two single beds, a bathroom with shower and integrated living / dining room / kitchen. Fully equipped kitchen with: ceramic hob, fridge-freezer, washing machine, oven, microwave, dishwasher, crockery / cutlery, kettle, juicer, toaster, coffee maker, kitchen utensils. It also has: Satellite TV (Spanish, English, German, Dutch, French), iron, hair dryer, safe and free Internet access (WiFi). In fenced outdoor area that allows your privacy you will find private pool for exclusive use of our reserves, garden area with fruit trees and BBQ area. This magnificent Villa is ideal for couples, groups and families alike. The town of Soo is located in the Lanzarote municipality of Teguise, the first capital of the island. The Villa de Teguise was the capital of the island from the first half of the 15th century until 1852 and thanks to its historical legacy it has been declared an historic-artistic architectural complex. It is about 25kms from Lanzarote Airport, scarcely 30 minutes by car. La Caleta de Famara with its majestic beach of about 6kms is only 7 minutes by car. The National Park of Timanfaya about 18kms and the La Santa Club of high performance, less than 5kms. In this town you will find local supermarket and restaurants although it is very easy to travel by car to any other point on the island. Perfect for large group, lots of space both inside and out. Perfect for large groups, lots of space both inside and out. This property is also nice if you are coming over to practice some sport in this area. You have Famara Beach nearby and La Santa sports center. Thanks ones again and would like to have to back again. We had a fantastic Christmas holiday 17-31 Dec '18 as a family of five. The villa and grounds are large and well maintained in a very quiet village. The flies are a real issue though (this may be worse because the next door neighbor has chickens and goats). They are hover flies so no buzzing but they land on you all the time, crawling, dive bombing eyes and really irritating. This meant we couldn't eat outside not a problem with five of us at dining table for 6 but at full capacity you'd have to have sittings. It also meant you didn't want to open any windows, the villa has no form of heating (one evening we put the oven on with door open) or air con therefore the wardrobes are very damp, our clothes and bedsheets felt wet in the mornings. The weather was glorious and evening temperatures about 18c. We sat outside as the flies were less busy and it felt cold and damp inside the villa. The duvets were thin summer one's and it was cold at night, there was not any spare blankets so we took duvets from unused bedrooms, at full capacity you would need to ask for extra blankets. The pool is not heated and was artic in December! The children braved it but there seemed to be an issue with the filter and after a week it was very dirty. The pool men came 3 time's, one spending 5 hours cleaning which meant the kids couldn't use the pool for a day. The kitchen was well equipped with sharp knives!! Good sized pans, plenty of crockery, cutlery and glasses. There was a 2 slice toaster, kettle, microwave, coffee machine and electric lemon squeezer BUT only 1 plug socket, we brought a 4 plug extension. We did cook some fabulous meals but I think it would be a struggle cooking for 12 with only 3 rings and limited worktop space. The full size fridge freezer, washing machine and tumble dryer were a bonus. Plug sockets was another problem apart from the essential socket ie: TV, fridge and wi-fi in each room there was only one other socket and that contained a plug in fly repellent. So in the bedrooms or lounge we had to choose to have a lamp or charge our phone or repel flies. On check out the app said 11am but at 10.15am the cleaners were asking us to leave, they were friendly but insistent that we should have left by 10am. Please confirm or like me you will be running around gathering things in a black sack and packing the final things in a carpark! Wi-fi poor in bedrooms and no coverage in chalet. We wanted to get full information from our staff before responding to your comments. 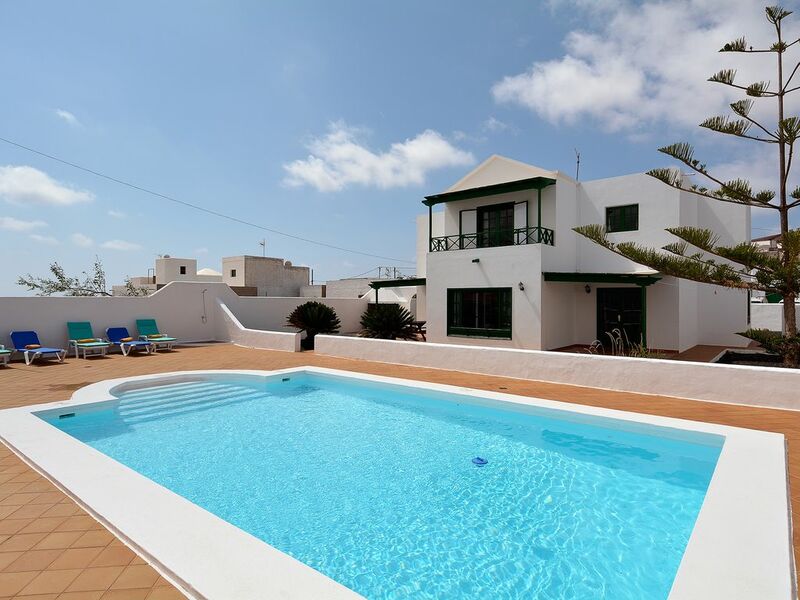 This property is excellent and is very well located in the village of Soo at the north-west of the island of Lanzarote. We have informed the authorities about the property next door and they are taken action on this. We regret that you have not enjoyed the outdoor area of ​​the property because it is spacious and perfect for a large group like yours. We are aware that this fact (beyond our control) has had an impact on your stay. It is also true that the check-out time is at 10 o'clock and is announced in the information of our property (see on this website). We are very flexible on times prior request from guest after checking that the property does not have another reservation scheduled on the day of your departure. In your case, we had another reservation that same day and you did not request for a late checkout, so the cleaning service showed up at 11.20am on the property (not even at 10am) given you and group enough time to pack up your belongings before they walk in to clean. We regret that you had not informed us beforehand as we would had notified you that it was not possible later than 11am. We hope for better communication in the future.